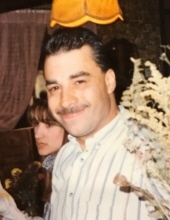 James E. Almeida – Age 54, husband of Julie (Vaughn) Almeida died unexpectedly Tuesday, Feb. 5 at the Lowell General Hospital – Saints Campus. He was born in Boston, December 12, 1964, a son of the late Augusto A. and Ann (Hamilton) Almeida and lived in Billerica for most of his life and attended Billerica Schools. James was an Auto Body Mechanic for many years having worked at Byrnes Auto Body in Lowell. He enjoyed going to New England Dragway with his uncles and attending family cookouts and fishing. He is survived by his brother, Robert Almeida of Billerica; his sisters, Debra Almeida of Manchester, NH, Judi Quinton of Tewksbury and Laura Almeida of Wilmington and his nieces and nephew, Jodi Daughenbaugh, Christopher Boyle, Michelle Boyle and Stefany and Alfred Quinton and his great nieces and nephews. He was the brother of the late Steven Almeida. A Celebration of James’s life will be held Saturday, Feb. 16 at the Billerica Moose Lodge, 104 Boston Rd., N. Billerica at 12 Noon. Relatives and friends respectfully invited. Memorial contributions may be made to the American Heart Association, P.O. Box 417005, Boston, MA 02241. "Email Address" would like to share the life celebration of James E. Almeida. Click on the "link" to go to share a favorite memory or leave a condolence message for the family.